At first, you might think that Croc vs. Shark is just something that gets discussed in the writers' rooms at SyFy. But there are some places in the world where crocs and sharks do swim the same waters. Like in Australia. 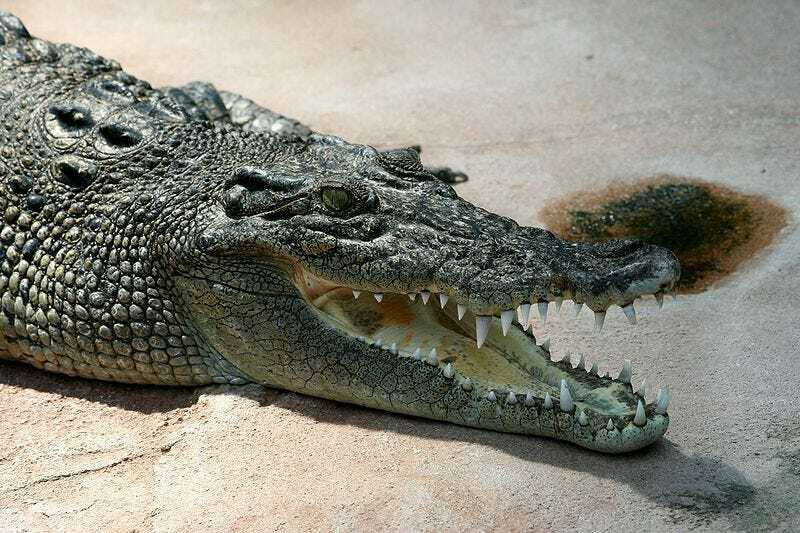 Brutus, the 18-foot local celebrity (who, according to legend, lost his front arm to a shark) is a saltwater crocodile, or saltie, which means he can survive both in fresh and in salt water, and in the brackish waters where the two meet. The massive species is also the largest living reptile on the planet. Likewise, bull sharks can also survive in fresh water. So it's not quite so unusual for the two to have met. Sydney photographer Andrew Paice was on a tour with his family on Australia's Adelaide River on Tuesday when he saw an 80-year-old saltwater crocodile (locally known as Brutus) with a juvenile bull shark clenched between its jaws. "We'd fed Brutus on the bank earlier and were coming back past," Paice tells Northern Territory News. "[We] saw something in his mouth ... Brutus took the shark back into the water and then started to shake it around a bit, [then headed] back into the mangroves like he was protecting his prey." Why turn to the ridiculous tales spun by Shark Week when there's real drama unfolding in the natural world?